All you need to know about New Jersey sports history. Frederick Carlton Lewis was born July 1, 1961 in Birmingham, Alabama and grew up in Willingboro, New Jersey. The family moved to the Garden State when Carl was a boy. His parents, William and Evelyn, started the Willingboro Track Club in 1969. Eventually more than 3,000 kids would go through their program, including Carl and his younger sister, Carol, who became a world-class long jumper. Their mother had competed on the international stage as a hurdler in the 1950s. Carl excelled as a long jumper, too—first under his father’s tutelage and later at Willingboro High School, where Paul Minore and Andy Dudek ran the Chimeras’ track team. As a senior, he jumped 26’ 8” to set a new prep record. Carl was known to every NCAA track program. Eventually, he accepted a scholarship to the University of Houston, where he was coached by Tom Tellez. By the time he enrolled, he was already ranked #5 in the world. In the spring of 1980, Carl’s freshman year, he won the NCAA championship with a jump of 27’ 4 1/2 “. He also began improving his time in the 100 meters dramatically. Carl would have competed for the U.S. Olympic team as both a long jumper and sprinter that summer in Moscow had President Carter not imposed a boycott. 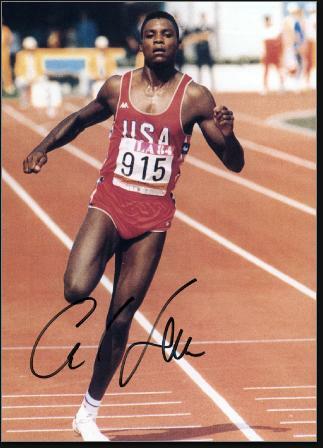 In 1981, Carl set a new personal best in the long jump and turned in the fastest time in the world (and the fastest ever at sea level), giving him a #1 ranking in both events. He was an easy pick for the Sullivan Award as the nation’s top amateur athlete. Carl’s goal was to better Bob Beamon’s long jump distance of 29’ 2 ¼” achieved in Mexico City during the 1968 Olympics. He topped 28’ numerous times in the early 1980s, but never reached 29’. He did manage to set a new world record at low altitude in 1982 of 28’ 8 ¾”—and surpassed 30’ at the same meet but was called for a foul, with his foot barely over the board. 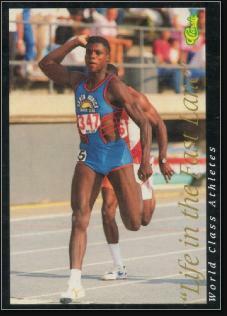 From 1981 to 1992, Carl was ranked either #1 or #2 in the world in the long jump. At the first IAAF World Championships in 1983, he won the 100 meters and the long jump, and later that season set his first unqualified world record as a member of the 4 x 100 team with a time of 37.86 seconds. At the 1984 Olympics in Los Angeles, Carl looked to equal the record of four gold medals set by Jesse Owens in 1936. He won the 100 meters and long jump, but disappointed fans by not trying to break Beamon’s record once he had clearly won the event. Carl was saving himself for the 200 meters and 4 x 100 relay. He won gold in both events, setting an Olympic mark in the former and a world mark in the latter. He was named Track & Field News Athlete of the Year for the third consecutive season. Although Carl remained essentially unchallenged in the long jump for the remainder of the decade, other runners began catching up to him in the sprints—most notably Ben Johnson. At the 1987 World Championships in Rome, Carl tied the world record in the 100 meters with a time of 9.93 seconds, but in the same race Johnson finished first, .1 seconds ahead. Carl couldn’t believe it. He intimated that Johnson was using a performance enhancing drugs. Another disappointment in 1987 was the death of Carl’s father. He buried his 1984 Olympic 100 meters medal with him, telling his mother that he’d win another one. Carl made good on his promise. He ran a 9.92 in the Olympic final, but finished second again behind Johnson. However, three days later Johnson failed his drug test and Carl was awarded the gold. Carl also won gold in the long jump. He earned a silver medal in the 200 meters, and came up empty in the 4 x 100 relay after his teammates botched a handoff and the squad was disqualified. After the Olympics, Carl’s 9.92 was declared the new world record by the IAAF and his 9.93 in 1987 was also recognized retroactively as a world record. Carl’s most amazing performance may have come at the 1991 World Championships in Tokyo. Having just turned 30, he defeated a field in the final that included five other runners who finished under 10 seconds. Carl’s broke the tape in 9.86 seconds for a new world record. That time would stand up until 1994. He also anchored the U.S. 4 x 100 relay, which set a new world record at the event. These achievements played second fiddle, however, to Carl’s showdown with Mike Powell in the long jump. They dueled back and forth, making one amazing jump after another. Carl’s best was 29’ 2 ¾”—breaking Beamon’s mark—but the wind gauge read just enough to tarnish the record as “wind-aided.” Moments later, however, Powell jumped 29’ 4 ¼” to win the event. It put an end to Carl’s decade-long 65-meet winning streak. 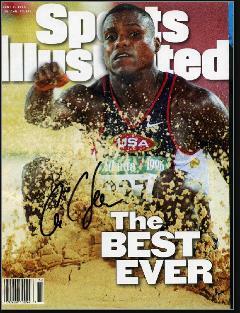 Despite this loss, Track & Field News declared Carl the greatest athlete to ever set foot on track or field. Carl failed to qualify for the 1992 Olympics as a sprinter, losing the last slot in the 200 meters to rising star Michael Johnson. Carl made the team a s a long jumper and technically was eligible to run in the relays in Barcelona. He defeated Powell for the gold medal and also anchored the 4 x 100 team for another gold. Their time of 37.4 seconds, which stood until 2008. Carl ran his leg in a blistering 8.85 seconds. Injuries began to slow Carl down in the ensuing years, but he continued to rank among the world’s top long jumpers. He qualified for the Olympics in this event for the fifth time in 1996. As luck would have it, the two favorites—Powell and Ivan Pedroso—were nursing injuries. Carl was at his best and won yet another gold medal—his fourth in the event and ninth overall. He might have won a 10th as a member of the relay team, but he had not trained with the other runners and was not invited to participate by coach Erv Hunt. Carl retired in 1997. Two years later he was voted Sportsman of the Century by the International Olympic Committee, Olympian of the Century by Sports Illustrated and World Athlete of the Century by the IAAF. All images on this site are from the collection of the authors. They are used for educational and informational purposes and are subject to standard copyright laws. Copyright © 2019 Upper Case Editorial Services, LLC.